"Hawai'i's Seeds and Seed Leis"
the round beads of the canna lily. About three years ago, Laurie Shimizu Ide, then the owner of "Pearlridge Florist," noticed a resurgence in interest in seed lei. "With the Hawaiian renaissance and Hawaiian prints coming back, people were going into kukui nut leis," she said. Soon, local crafters started producing lei from other seeds, and still more began to come in from the Philippines. "Before you knew it, we had 10 different seed leis that we didn't have the names for," said Ide. She set out to find a resource so she could answer customers' questions about the lei, but had no luck. "I put together a log and the log turned into this seed identification guide," said Ide. 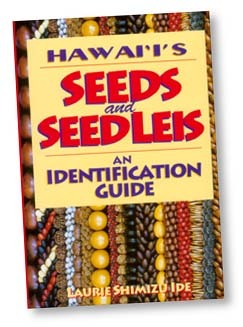 "Hawai'i's Seeds and Seed Leis: An Identification Guide" has been released with holiday shoppers in mind. The slim paperback is chock-full of color photography. Pictures show each lei seed with the pod it comes from if applicable, details of the source plant and a finished lei. There are 53 seed lei covered in the book and their diversity is amazing. Colors range from the white of p"'ohe'ohe or Job's tears (Coix lacryma jobi), to the black of Hawaiian soapberry or mÅnele (Sapindus saponaria). Yellows, reds, grays and every imaginable shade of brown fill out the spectrum. Perhaps greater than the variety of hue, however, is the range in shape and texture. Many of the seeds in the book can be polished to a slick luster. But some, like the ironwood or pa'ina (Casuarina equisetifolia), retain a craggy appearance. Others, like the milo or portia (Thespesia populnea) are covered in a fine fur. Shortly after noticing the resurgence in popularity of seed lei, Ide began to try her hand at the craft. "As crafters here in Hawaii, especially plant lovers, we want to bring this fad back strong. "The satisfaction is great," she said. She meets with a group of friends who learn from each other. After selling her florist shop last year, she began work on her next book, due out in March, which will be a how-to on seed lei making. "I've been going full speed on this and I thought I'd be finished a long time ago, but I wanted to make each lei myself," she said. She also does all her own gathering and preparation, so she can communicate those challenges in the upcoming book. She said gathering seeds should simply be a matter of noticing what's around you, identifying a seed you find attractive and checking to see whether it is toxic. "I think that's how people start, rather than, 'oh that's the most expensive kind of seed lei if I were to buy it from a craft fair, so that's the one I want,' " she said. A few of the seeds in the identification guide are toxic, causing anything from rashes to respiratory problems. Ide discourages novices especially from working with the potentially lethal be still (Thevetia puruviana) or black-eyed Susan (Arbus precatorius) seeds, for example. A favorite of Ide's is the blue marble (Elaeocarpus grandis). She likes the deeply grooved texture of this round, light brown stone. "It looks exotic, different, interesting," she said. The most difficult seed she's worked with is the canna lily, said Ide. "I've crocheted smaller seeds, but this one is more challenging. I'm going to put this one down at an expert level," she said. "It's a hard seed and it's slippery to drill, so I saved this one for last." While Ide said she is not a gardener, she is a plant lover. Her favorite seed-lei host plant is the mauna-loa (Canavalia cathartica), which she also uses for flower lei. Ide drew on her experience as a florist to write "Hawaiian Lei Making, A Step by Step Guide," her first book. In her newest book, Ide uses single-seed lei throughout for identification purposes, and says most crafters are still working with one kind of seed for each lei. "I've talked to people who say, '20 years ago I was doing this and we did combination leis,' " she said, but they don't seem to have come back just yet. Seed lei storage is also covered in the book. As Ide points out, seeds are meant to sprout. So if you buy or make a lei of whole seeds, precautions must be taken to keep them from germinating. The easiest method is to store the lei in a sealed plastic bag in the refrigerator. Alternatives include freezing the lei in a sealed plastic container; placing mothballs in an unsealed bag inside the sealed lei bag or wrapping the lei in dry tobacco or bay leaves before sealing and then storing it in a cool place. "The best part of it would be, when you've completed the seed lei, is knowing it will last. It will last forever if you take care of it. Whereas flower lei, and we've made thousands of them, they don't last," said Ide. Gardening Calendar in Do It Electric! Stephanie Kendrick's gardening column runs Fridays in Today.